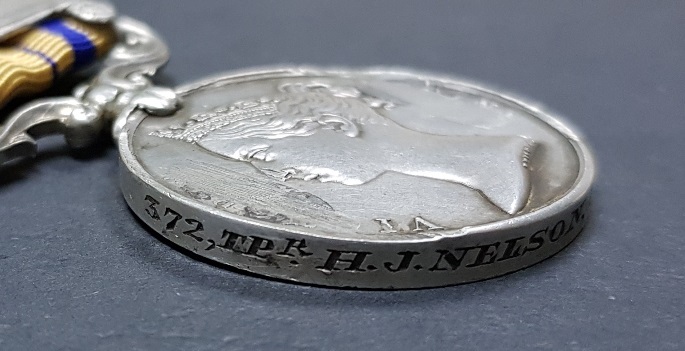 With Cam Simpson's recent excellent work being published which covers the exploits of this famous unit, I thought I would post the story of one of the two medal recipients I have to them - that of Horatio Nelson - the other chap is Grissair who was Captain Hunt's batman. Despite his name our Horatio Nelson was never a sea-faring man. Born to Joseph and Rosalie Sarah Nelson, nee Murphy, in Bathurst, a small hamlet between Grahamstown and Port Alfred in the Eastern Cape, on 23 May 1847 – he was destined to play his part in the Zulu War with one of the most famous and highly thought of irregular units that ever took to the field – the Frontier Light Horse. At the time of his baptism, performed by the Colonial Chaplain, James Barrow, on 27 June 1847, the Eastern Cape and certainly the portion thereof in which the Nelson family resided, was a hot-bed of conflict and tension between the settlers on the one hand and the native tribes of the Pondoland area on the other. Settlers like Nelson and his family were there to forge a new frontier for themselves and the Empire, in so doing they encroached on the land and lifestyle of the black tribes in the area. This incursion wasn’t well received and as many as nine Frontier War were fought as a result, resulting in the loss of lives as well as livestock on both sides. The Eastern Cape Frontier was also not a place for the faint-hearted, quite aside from the perpetual threat of conflict was the barrenness of the soil and the unforgiving nature of the terrain – all factors which the hardy settlers had to master before a living could be eked out of the soil. It is into this environment that Horatio Nelson was born. As the years progressed conflict erupted to the north of the Eastern Cape, in the Colony of Natal. Here a fragile peace had reigned between the white colonists and the Zulu nation with the Tugela River being drawn as the border between the two – separating Zululand from the rest. This border was, for the most part, respected but towards the end of 1879 a Zulu raiding party in hot pursuit of a Zulu Royal who was in trouble with Cetewayo, the King, crossed over onto the Natal side in order to apprehend him and his followers. This “act of aggression” gave the Colonial authorities the excuse they needed to commence with an invasion of Zululand. One of the Colonial regiments called on to assist the British effort was the Frontier Light Horse, commanded by the redoubtable and well-liked Redvers Buller. Preparatory to a full scale invasion the F.L.H. arrived in Natal from the Transvaal (where they had been active in the Anglo-BaPedi War) in December 1878. Battle hardened from previous conflicts in which they were engaged they were ideally suited to the terrain. Having joined Colonel Evelyn Wood’s No. 4 (Left) Column at Utrecht on the Transvaal border with Natal they were, by January 1879, operationally active. Not involved in the slaughter at Isandlwana on 22 January they, nevertheless under Buller’s firm leadership, were continuously in the field harassing and hounding the local Zulus in their ambit of operations. It was mainly the Abaqulusi tribe who enjoyed their attentions. In March of 1879 some 20 000 Zulu warriors converged on Wood’s No. 4 Column and the F.L.H. were called upon to fight two decisive battles in the space of 48 hours. 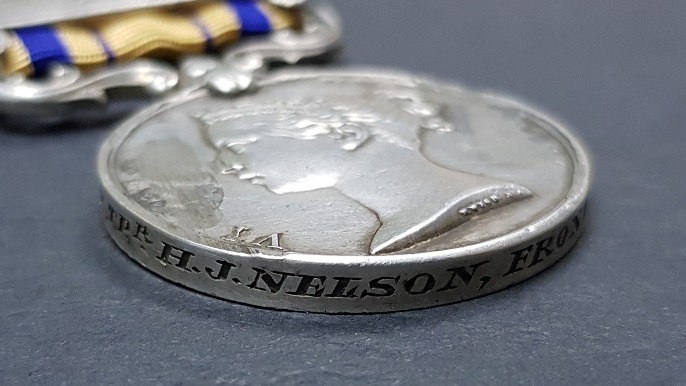 It was in March, on the 13th, that Nelson joined their ranks as a new recruit. A mere two weeks later he underwent his baptism of fire and what a baptism it was – the assault on Hlobane Mountain. On the plateau of Hlobane were between 800 to 1000 Abaqulusi warriors along with 2000 head of cattle. Buller knew that, should he defeat them, almost all resistance in the area would be crushed leaving Wood’s No. 4 Column with an almost open road to Ondini (Ulundi) King Cetewayo’s capital and seat of operations. The decision to attack Hlobane rested with Wood who initially dithered but at last came to the decision to press on. It was decided that the F.L.H. were to ascend the mountain from the eastern side, clear the area of cattle, and then descend by the most practical route. Having neared the mountain by midday the F.L.H. off-saddled, rested, prepared a meal and brewed tea until well after dark creating the impression that they were settling in for the night. In silence they saddled up again and worked their way around to the eastern side in accordance with the plan. In pouring rain the order to move out was conveyed at 03h00 with “C” Troop leading followed by “B” Troop with “A” Troop forming the rear-guard. As they approached the lower slopes at about 06h15, they were met by a withering cross fire from the Abaqulusi hidden among the rocks. Having weathered that storm by dislodging the warriors from the boulders they pressed on managing to secure the lower slopes and started to round up cattle for the return trip. Undetected the Zulus had been reinforcing and Buller gave orders for his men to meet at the eastern side of the mountain. Almost driven into a corner the force now faced the prospect of being mowed down by an ever increasing number of Zulus or try and negotiate the narrow treacherous path by which they had ascended the mountain. All the while the large Zulu army returning from Isandhlwana was a matter of minutes away making the F.L.H.’s situation even more desperate once they had successfully, although with heavy losses, negotiated their descent. It was helter-skelter all the way down with men and horses tumbling down in blind panic, trying to reach the bottom and relative safety; all the while being shot at and stabbed at by Zulus who were only several feet away in many instances. Acts of heroism were many as those who reached the bottom hoisted stragglers onto their exhausted horses or turned back to come to the rescue of a comrade. The horses, traumatised by the ordeal they had undergone, were oftentimes unable to reach a gallop leaving their riders almost at the mercy of the fleet-footed warriors waiting among the grass below. It was in this action that Buller received the Victoria Cross. Three Officers and twenty six other ranks lost their lives that day with two wounded and many nursing light injuries that remained on strength. The ratio of dead to wounded was attributed to the fact that the Abaqulusi speared those they caught up with, killing them where they fell. Nelson was one of the lucky few who escaped Hlobane, presumably relatively unscathed. He and the surviving members of the F.L.H. returned to Wood’s camp which had been set up at Khambula about 30 miles away where, it was fully expected, the main Zulu army previously referred to would attack the camp. The mounted men, though fatigued, regrouped as it was expected that an attack would be made on the camp by the main Zulu army of some 17 000 warriors. The men sat around the camp fires enjoying their tea but sleeping in wet clothes in readiness, along with Wood’s other units numbering some 2000 men, for the anticipated attack on the morrow. With the break of dawn Buller’s suggestion to Wood was that he take out the mounted troops to both provoke and entice the Zulus into a premature attack. This being agreed to Buller rode out of the Kambula laager with the F.L.H. and about 80 other mounted troops, deploying in an extended line. Some 5000 Zulus were sweeping across from left to right as the F.L.H. dismounted at a few hundred yards distance and opened up with an intense and accurate fire inflicting many casualties among the Zulus. The ploy worked and they turned towards Buller’s men who quickly mounted, retreated a short distance, dismounted and opened fire again. This process was carried out a number of times until the Zulus were almost upon the laager’ northern aspect at which point a gap was opened in the laager for the F.L.H. to pour through. Several hundred Zulus were killed, many of them with their own assegais, during this bloody rout. The battle of Kambula was seen as the turning point, one that changed the direction and ultimate outcome of the war. The Zulus rash attempt to devour No. 4 Column had led to the death of at least 1000 of their best men –men who had tasted British blood at Isandlwana and who had deemed themselves invincible as a result. Despite the instrumental role they played on the day, being always in the forefront of the action; the F.L.H. losses were slight with 2 dead and 2 wounded. The past 48 hours had transformed, in some instances, boys into men, with Nelson being no exception. The F.L.H. now enjoyed a period of relative inactivity as preparations for Chelmsford’s second invasion of Zululand took shape. Part of this was the creation of Wood’s Flying Column out of No. 4 Column – the F.L.H. were an integral part of this force. On 5 May they departed from Kambula moving ten miles south and then on to a new camp at Wolfe’s Hill. From then on until the war came to an end the F.L.H. were involved in numerous skirmishes and patrols. 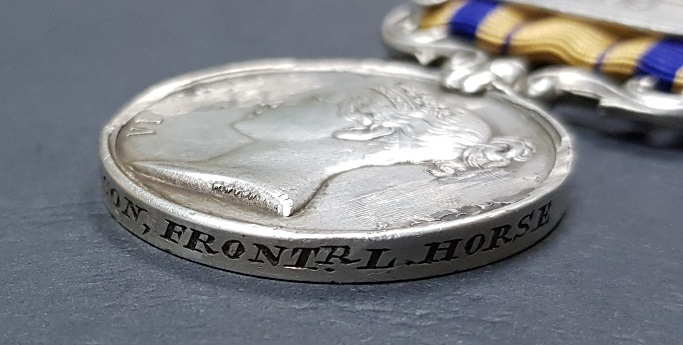 At the end of the war they had just two troops in the field and in late September when the pacification operations concluded they were imminently about to be disbanded but a last minute reprieve found '100 Hand-picked' men in two troops under H.C.D. D'Arcy VC bound for Middleburg during the Boer disturbances in that town. These disturbances were just prior to the Second Anglo-Pedi (Sekhukhune) War. 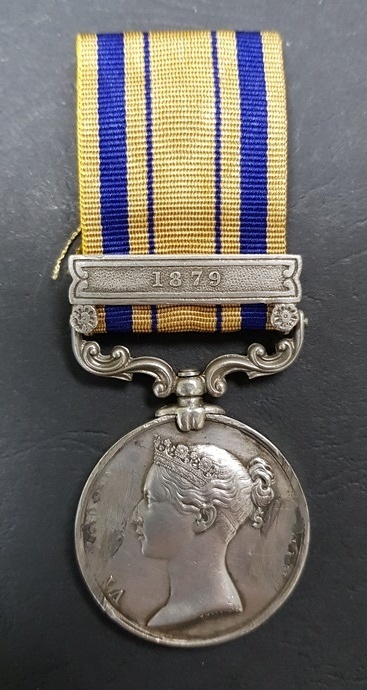 Sadly the '100 Hand Picked' men as they were known were returned to Pietermaritzburg in January 1880 and disbanded without any form of muster parade or form of recognition in the last week of that month. 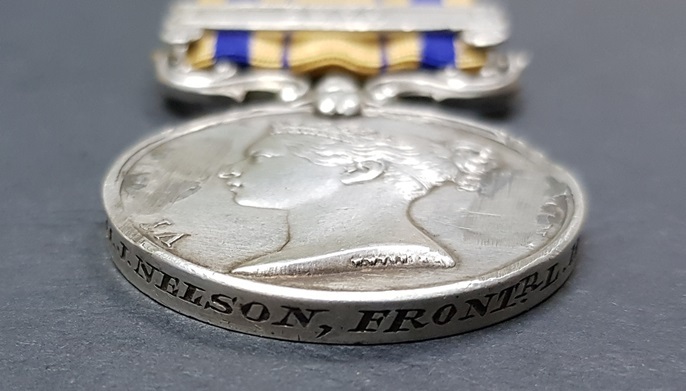 Nelson was one of “The Hundred” - for his previous efforts he was awarded the “Zulu” Medal with 1879 clasp – a well-won medal. Returning to the Eastern Cape he settled, initially, in the King Williams Town area, occupying himself as an Assistant Baker. He passed away in the village of Peddie from Congestion of the Lungs and Endocarditis, which he had been suffering with for the previous 9 months, on 27 February 1902 at the age of 55. He had never married. That's fantastic, Rory. Many thanks. Could you post a link to Cam's book please?